It struck me a few weeks ago that the two pocket cameras we’re bringing are not that great. I love my little Nikon, but it’s getting a bit long in the tooth. It’s never been great at low-light (blurry, noisy blogs), it’s slow to focus, if it finds the focus at all. I wanted something better to help us remember this unique time. And so I began to do one of my favorite things: researching gadgets. A few days later I ended up at Samy’s Camera on Fairfax, holding several grand worth of Canon 7D. I didn’t want to sell my vehicle to purchase a camera (especially one being carted around Europe in a backpack), I asked if they had something cheaper. He introduced me to the Canon Rebel T2i (EOS 550D to the rest of the world). Brand new, just released last month. Similar sensor and processor as the 7D, and the same video abilities (1080p, with control over exposure, gamma curves, etc) and for less than half the price. Some more research confirmed the hype. I was feeling good about it, but the clincher for me were the stunning videos I’d seen online, shot with the camera. One titled “February” sticks out in my mind. I purchased it with the kit lens, a Canon EFS 18-55mm f/3.5-5.6 — decent, not amazing, but it fit the budget. With it, I shot the short test below during my lunch break last Wednesday. Since shooting this, my (now former) boss gave me a gorgeous new lens as a going away present. It’s a Tamron 28-75mm f/2.8. Fast, sharp — just beautiful, and an excellent walking around lens. It’s what I will take with me on the trip. And…that’s where the list ends. My parents are in town through Tuesday and they’re from L.A. so new and exciting activities are always fun. Let the ideas and suggestions flow! It’s official: our Monday flight to London has been canceled due to a massive cloud of volcanic ash sauntering over Europe. We just received word from the airline, and now Halbe and I are looking into our options. For those who haven’t heard, a volcano in Iceland has been erupting since last week. Its plume of jet-engine-killing ash has enveloped the majority of the continent, leading to what the Wall Street Journal has reported as “the largest air traffic grounding since World War II.” We’re standing (well, lying on an air-mattress) in our empty apartment, working out our next steps. We’ll update when we know more. UPDATE 1:30 PM: We have re-booked our flights. We will be staying with family friends in LA for the week, then fly to New York on Friday evening. After the influx of travelers from canceled flights that preceded ours, the first flight to London we could book departs Sunday, April 25. So, we’ll enjoy a relaxing stay-cation here in the City of Angels. This feels a bit like a blessing in disguise. It has been very “go go go” with the 19th as the finish line. Now an Icelandic volcano just threw that ticking clock right out the window. Halbe and I have never been without jobs at the same time in LA, and we’d like to take advantage of that. It’s ironic that it took a trip to Europe for us to spend some quality time exploring our own city. Also, a shout out to the Droid. We have no internet at the apartment (again, squatters in our own home), so from the initial text message alert to re-booking the flights, to writing this blog entry, I did it all on my Droid. It’s a great, little device. We moved last weekend, but not into another apartment like we usually do. Instead, we moved into a 10x10x10 storage unit in Van Nuys. 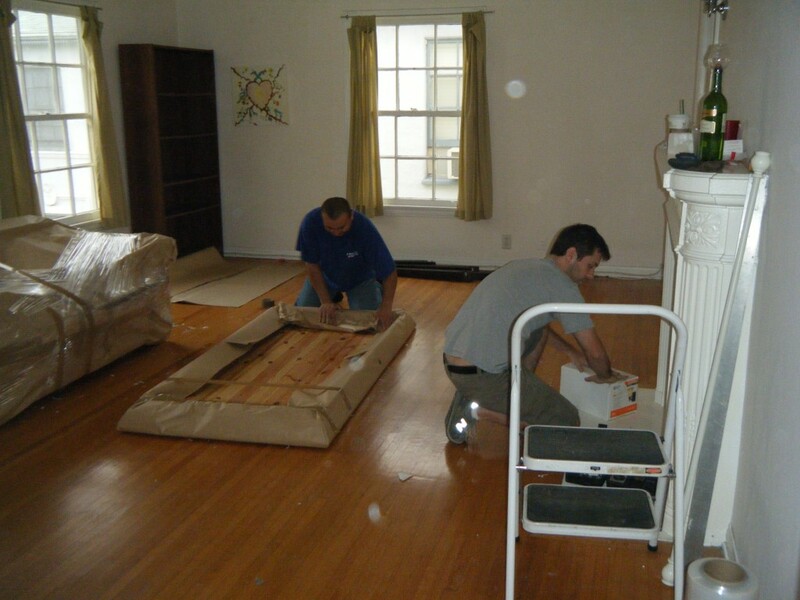 We hired A Better Way To Move, who sent Paco and Tito at 8 a.m. on Sunday ready to haul our furniture and 30 boxes into their truck. After scanning the apartment to see what was involved in the move, Paco said to us, “don’t worry, we’ll handle all of this – go and enjoy a cup of coffee.” My kind of mover! After 2 hours had passed, they had our entire apartment in their truck. Upon arriving to Van Nuys, I looked again at the storage unit we’d rented and doubted that all of it would fit. You always end up with more boxes than anticipated! But, with a mover like Paco, you’d be amazed how much you can fit into a tiny space. Paco played tetris with our furniture for 2 hours and in the end, the truck was empty and we had room to spare in our storage space. At one point, I’d gone to our storage unit to get a status update and our sofa was in the middle of the hallway. When I went back five minutes later, it was in the unit on its side, four feet off the ground and piled on top of a couple of boxes. “Paco, did Devon help you with that?” “No, I did that,” he said. “All it takes is a lot of leg muscle and a little body mechanics.” Well, no amount of my body mechanics and leg muscle could do that, so color me impressed. By 2:00 Devon and I were back at our empty apartment. “But where are you guys going to sleep,” you may ask. “Well, in our apartment of course!” See, we’ve set up our inflatable mattress in the bedroom, kept one fry pan, one pot, 2 cups and our flatware in the kitchen and two towels in the bathroom. Oh, and some clothes. Since we have limited utensils for basic stuff, we’re having to get creative. I flip my fried egg with a paper plate, mix my scrambled eggs in a plastic cup and cut tomatoes with a dull butter knife. Man I miss my Wuesthof knives and my spatula. 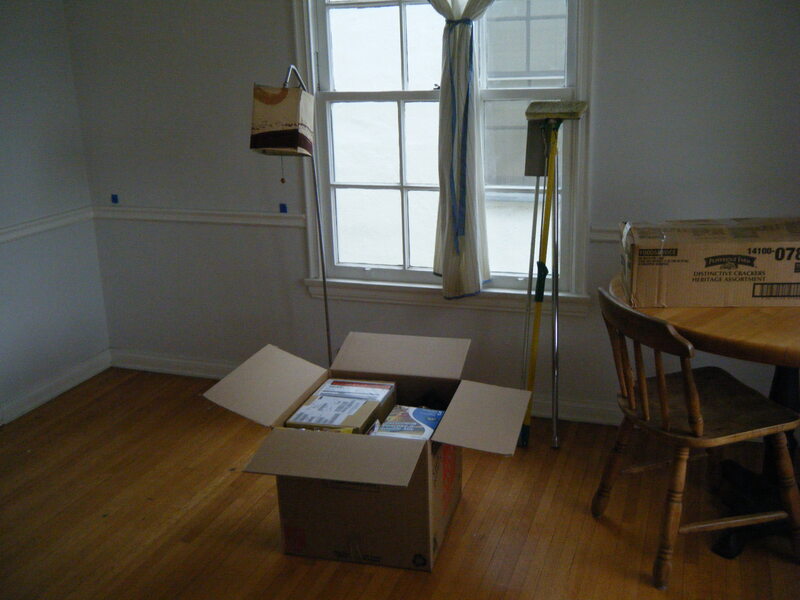 Now, as we walk about in our echoing rooms we’re feeling a little bit like squatters in our own apartment. We paid rent, really we did. This Sunday, the 18th though, we say good bye to our beautiful one bedroom and begin living out of two 60 litre backpacks. Maybe Paco will come by and help us pack. I could sure use his tetris skills. Get an oil change. I read from a few sources that recommended getting an oil change before AND after storing. Fill the tank with gas. The moisture in the air of an unfilled tank can condense on the sides, leading to rust. Add a stabilizing agent to the gas, to prevent it from breaking down. I used 6 ounces of STA-BIL ($4.99 at Kragen) for my 15 gallon tank. No funnels were on hand, so we made one from a piece of PVC and the top of a 2-liter soda bottle. Leave the car out of gear (it’s a 5-speed), and emergency brake off. For an automatic you’d put it in Neutral. Gears and brakes can freeze in place if left long enough. We kept the car in place with wedges of firewood acting as chokes on the wheels. Attach a trickle charger to the battery. A battery will naturally go dead after a few months, which I’ve heard is not good for it — reduced amperage maybe? We’re using a solar-powered charger, which plugs directly into the cigarette lighter, keeping the battery topped up from there. Wash the car, let it dry, then cover the car. I picked up a cheap ($29.99) Valucraft car cover from AutoZone. You can spend hundreds on fitted, waterproof covers, but my ultimate goal was to just keep the sun and dirt off for five months. The washing was to get rid of as much grit and dirt, which would act like sandpaper on the paint under the cover. File for “Affidavit of Non-Use” from the DMV. This is a California thing. A car registered in California is required to minimum amount of liability car insurance — a not insignificant monthly cost. To avoid this requirement, one can file an ANU. I’ve heard an insurance company reports when the stop/start coverage of vehicles to the DMV, leading to a possible automatic citation, so to be safe we filed the ANU online prior to terminating the liability coverage. Place the car on a “comprehensive-only” insurance policy, to protect against theft, vandalism, and Acts of God. So, if vandals take my car for a joy ride and are struck by lightning, I’m covered. The policy is much cheaper than liability — about $50 for the duration. I was advised by my mechanic to NOT have someone come out and turn the engine over every few weeks. Supposedly just running the engine at an idle will not get it up to operating temperatures, and the repeated cold starts will cause more damage than help. That’s about it. Hopefully in five months I’ll come back to a well-preserved car, ready to drive my unemployed self to all those job interviews. 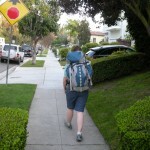 While a Boy Scout I used an REI external frame backpack. I had a great time in Boy Scouts, but the pack, well, could have been better. It was heavy, and not particularly large. The shoulder straps were thick, sweaty, and connected too low on the frame, causing the entire pack to fall away, like a drunkard swinging from a lamp post. The hip straps were meaningless. I listed it for 30 bucks on Craigslist. No one called. But, it carried my gear for years, so I can’t speak too poorly of it. However, for this trip, we knew we needed something better. On the advice of a friend, we visited Adventure 16 on Pico. 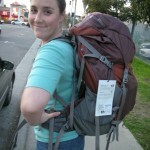 It’s similar in size to an REI, but friendlier, and the prices a bit lower. 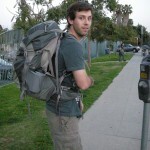 A kind clerk named Doug walked us through latest backpacks available. Doug and I agreed to disagree on that one, but the packs he suggested for us felt good in the store. They were on sale, too (2009 model — they’re trying to get rid of them to make room for the 2010’s). That’s how we ended up with a Gregory Z65 for me, and a Gregory Jade 60 for Halbe. They were about $160 each. But! 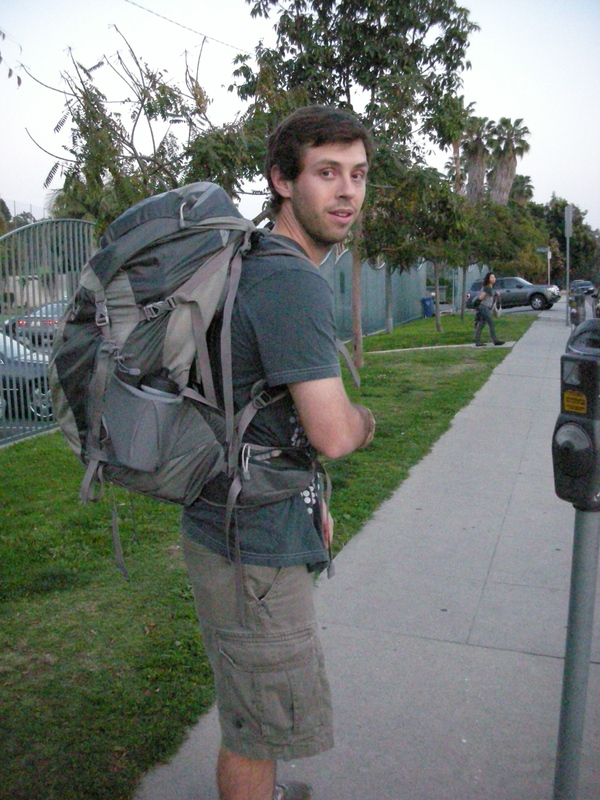 Someone had offered to loan Halbe a Kelty backpack for the trip. And, after years of childhood pain, I wanted to be sure I’d made the right choice. 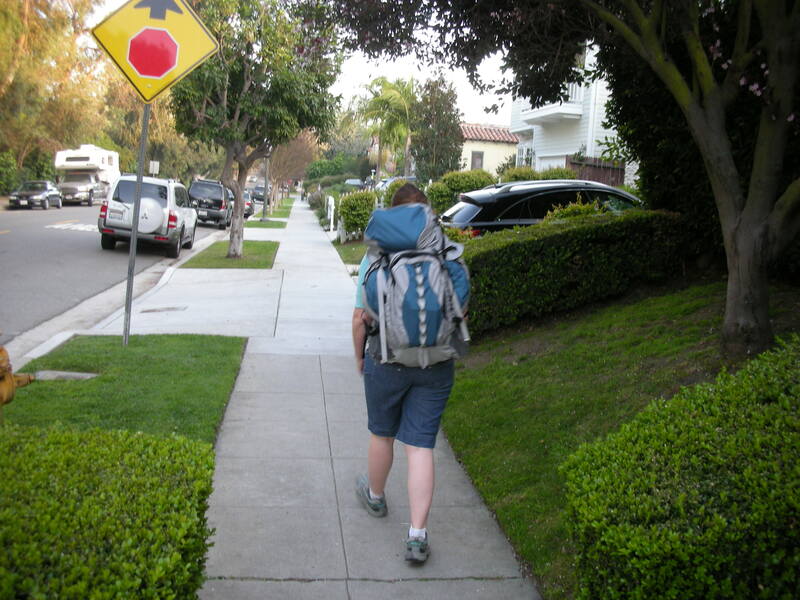 We filled our packs with clothes and cans of soup to simulate a full load (35 pounds for me, 29 for Halbe) then took them for a hike by the Rancho Park Golf Course. The Kelty was not nearly as comfortable for Halbe. Though the shoulder pads were thicker than the Gregory, they cut deeper. 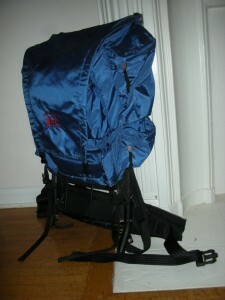 The Gregory packs have an air pass-through area in the mid-back, to help keep cool. 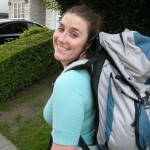 Though it was not warm out, Halbe’s back became uncomfortably hot after only 15 minutes of Kelty. Plus, the Gregory packs have zipper access to the entire length of the storage area (others only had top access). The shoulder pads were comfortable. 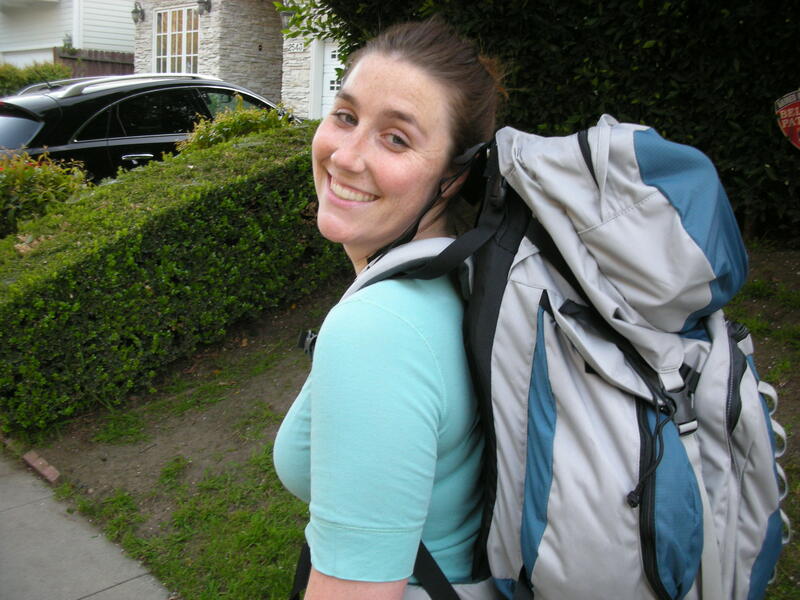 Despite carrying the equivalent of a toddler on my back, I didn’t feel overly encumbered. 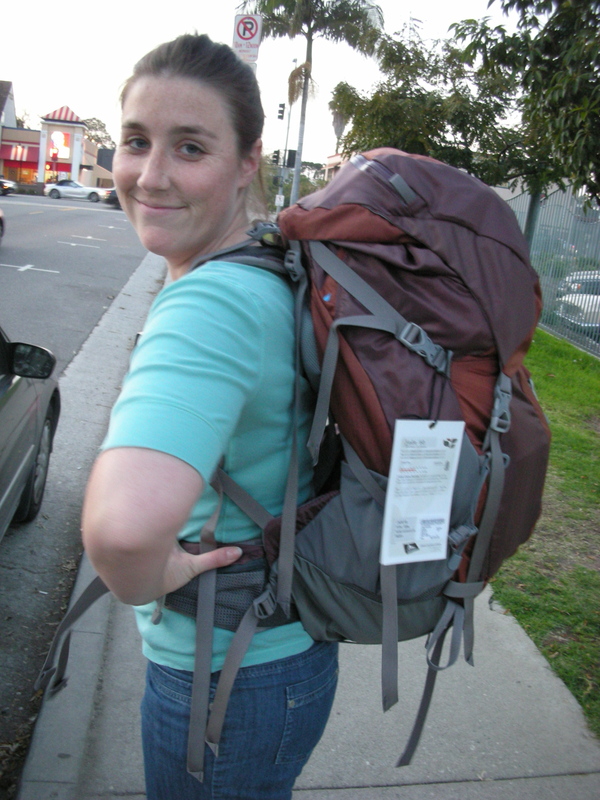 The hip straps were actually holding weight, and the bag (after a few adjustments) felt secure on my back. We walked a few miles (and garnered a few quizzical looks from the golfers), then decided the Gregory packs were the way to go. Backpacks, done. Good. Now we need to decide what to put in them. Fitting our lives into 65 liters of space will be a challenge. 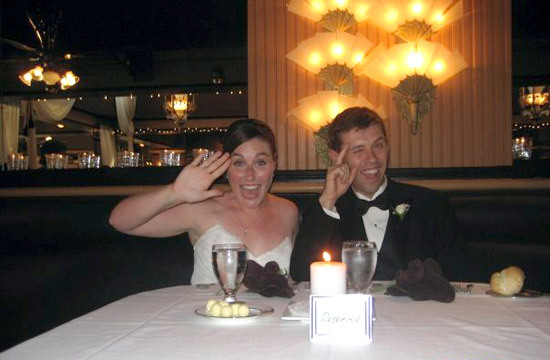 On April 19, 2010, this newly married couple on the cusp of their 30’s will begin a 5-month experiment, working and eating our way through Europe to learn about agriculture and sustainable living. On this blog we plan to track our observations, efforts and share what we learn. Five months, three meals a day: 450 meals. Devon and Halbe, post-ceremony and ready to eat!